Garlic has been a significant component of Mediterranean, East Asian, and African cultures for centuries. Not only known as a potent flavor contributor in the culinary realm, garlic is also revered for its medicinal abilities including antimicrobial, antiviral, and anticancer properties. Recently, western science has taken an interest in the ancient plant and uncovered evidence supporting its viability as a health-optimizing food. 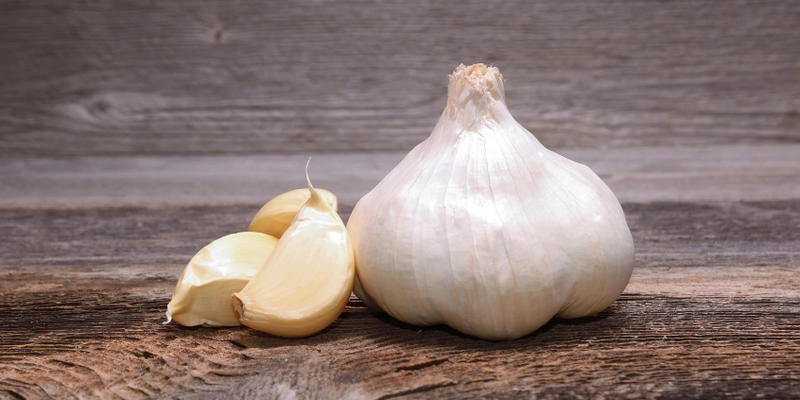 Below we detail garlic’s potential effects on key biomarkers, including cholesterol and blood glucose, as well as its protective role against high blood pressure and the common cold. 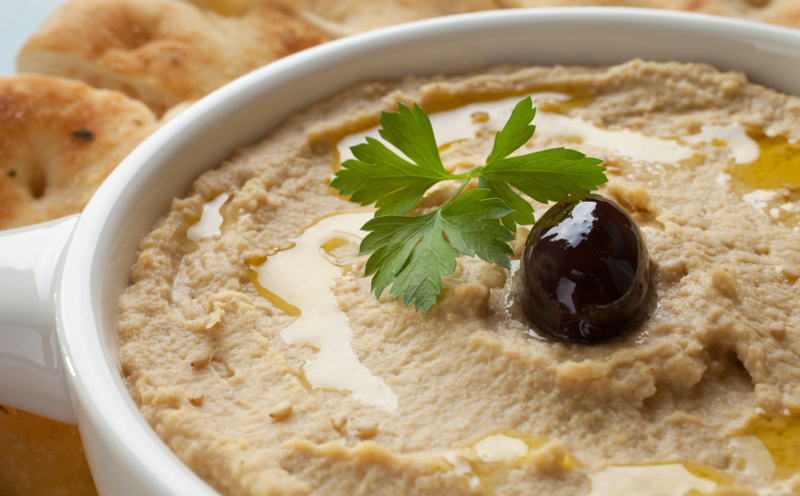 Research suggests that allicin is the main source of garlic’s health benefits. It is found both in fresh garlic and garlic supplements. A typical clove of garlic weighs 4g, is 65% water by weight, and contains around 2mg to 5mg of allicin, depending on clove size. Chewing raw garlic will relay the highest amount of allicin into your body. If cooking garlic, it is most effective to let it set for 10 minutes to one hour after cutting or crushing it in order to fully develop the allicin. It should be cooked for no longer than 5 minutes. Garlic powder is essentially just dried garlic but does not contain a substantial amount of allicin due to the processing. Most garlic supplement tablets are dried garlic with the addition of allicin. If you are searching for a garlic supplement, be sure it has additional allicin in order to gain garlic’s health benefits. Supplements can range from 100mg up to 2000mg of garlic powder and usually include 1mg of allicin, significantly less than fresh garlic. So, what are these proposed health benefits of garlic? Cholesterol is a big one. Studies have shown that garlic can produce modest effects on the three big lipid markers: total cholesterol, LDL and HDL. In a meta-analysis, supplementation with garlic reduced total cholesterol an average of 15 mg/dL across 22 different studies, a noticeable decrease. LDL cholesterol was lowered by about 8 mg/dL. The effects were the greatest when over 800 mg of garlic was taken daily for over 3 months. HDL cholesterol was shown to increase substantially by 10mg/dL in another study. The greatest results were for individuals that had high levels of total cholesterol and LDL or low levels of HDL. Garlic is thought to decrease the synthesis of cholesterol by inhibiting HMG-CoA reductase, an enzyme essential in the creation of cholesterol from fatty acids. A few other organosulfur compounds in garlic may inhibit other reactions further down the cholesterol synthesis pathway, too. Ultimately, the result is that less total cholesterol and LDL are produced. HDL cholesterol’s main role in the body is to remove LDL. It captures LDL and takes them back to the liver before they can become oxidized and form plaques in the arteries. With less LDL to remove, it is probable that more HDL cholesterol will remain in circulation. Garlic’s effect on C-reactive protein is also under investigation. C-reactive protein, CRP, is a protein produced in response to inflammation, both acute and chronic. High levels of CRP have been associated with an increased risk of developing certain diseases. Some experimental studies have shown that garlic may reduce CRP; however, larger studies need to be conducted. A particularly interesting study was conducted on pregnant women. Supplementation with garlic for 9 weeks starting at their 27th week of pregnancy reduced CRP by 2.79 mg/L compared to placebo. Another study conducted on firemen showed that garlic combined with coenzyme Q10 reduced CRP by 1.03mg/L. The proposed mechanism is due to garlic’s high antioxidant content which increases the production of anti-inflammatory compounds that in turn inhibits inflammatory markers, such as CRP. 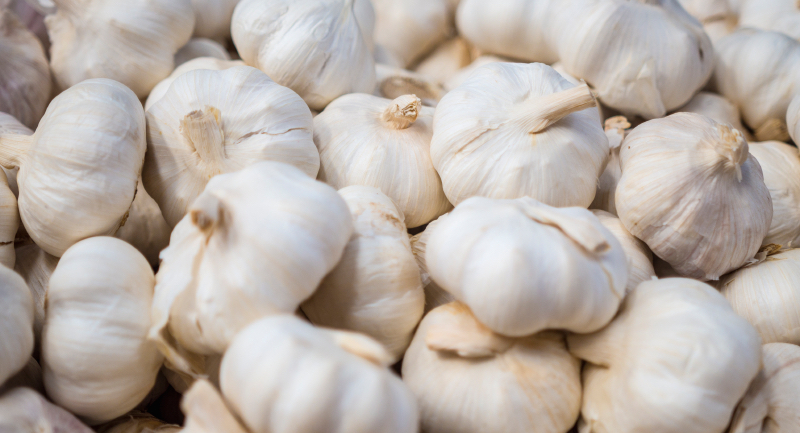 More research is needed to determine if garlic can actually affect inflammatory biomarkers, but the preliminary research is interesting. A few other diseases may also be influenced by garlic. Garlic has demonstrated the ability to increase nitric oxide, which plays an important protective role in cardiovascular health by regulating blood vessel function. Dysfunctional vascular endothelium, the lining of blood vessels, may promote high blood pressure, inflammation, platelet aggregation (the beginning of clots) and leukocyte adhesion (the beginning of plaque). Moreover, two studies showed that garlic may reduce the accumulation of calcium in the arteries, or calcification. Calcification can lead to the progression of atherosclerosis, a disease that hardens and narrows the arteries increasing the risk of blood clots, heart attack, and stroke. While garlic may influence the development of these cancers and other diseases, it does not replace conventional medicine. Instead, garlic may be an easy addition to nudge mostly healthy people toward their optimal levels of biomarkers. How can you Increase your Garlic Intake? As you may suspect, one of allicin’s breakdown products lingers in the body for several hours. It is typically excreted though the kidneys, skin and lungs resulting in the well-known consequence of “garlic breath”. Mouthwash and mints are not particularly effective at cutting through the waning smell, although parsley has proved to be somewhat helpful. The best tip, however, is to enjoy a meal with friends and family so that they too bask in the aftermath of garlic’s healthful benefits. With the potential to decrease cholesterol, blood glucose, blood pressure, inflammation and the risk of certain cancers, garlic is a relatively small way to have a big impact on your health. Many of these conditions are also interrelated and, when combined, can increase the likelihood of developing complicated diseases such as atherosclerosis and metabolic syndrome. Identifying the less than optimal areas of your health is the first step to improving it. Could garlic be beneficial for your specific biochemistry? Get your biomarkers tested! 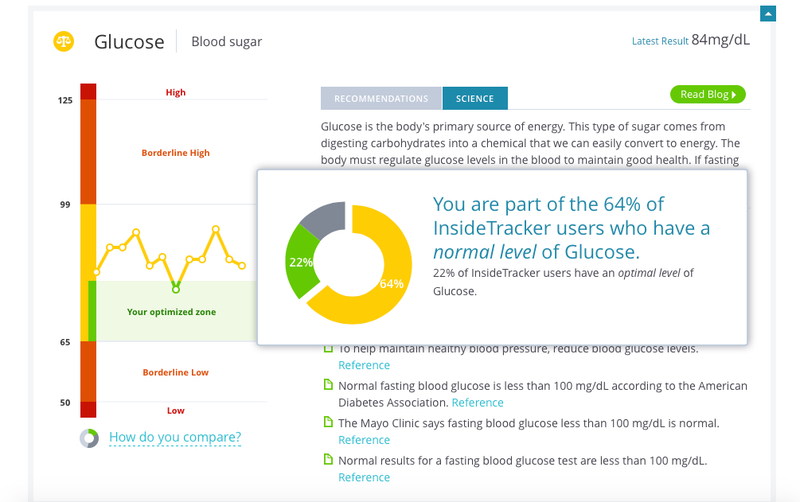 InsideTracker tests 30 different biomarkers related to health and longevity. Each biomarker is assigned an optimal range based on your individual characteristics. We know that one size does not fit all. With your results in hand, we provide specific nutrition, exercise and supplement recommendations backed by the latest research to help you reach your top health potential. Garlic is just the beginning. Let InsideTracker propel you to the finish line. Block E. The chemistry of garlic and onions. Scientific American. 1985;252(3):114-119. Abdullah TH, Kandil O, Elkadi A, Carter j. Garlic revisited: therapeutic for the major diseases of our times? Journal of the National Medical Association. 1988 Apr;80(4):439-45. Kwak JS, Kim JY, Paek JE, Lee YJ, Kim HR, Park DS, Kwon O. Garlic powder intake and cardiovascular risk factors : a meta-analysis of randomized control trials. Nutrition Research and Practice. 2014;8(6):644-654. Kojuri J, Vosoughi AR, Akrami M. Efects of anethum graveolens and garlic on lipid profile in hyperlipidemic patients. Lipids in Health and Disease. 2007 Mar 1;6:5. Liu L, Yeh YY. S-alk(en)yl cysteines of garlic inhibit cholesterol synthesis by deactivating HMG-CoA reductase in cultured rat hepatocytes. Journal of Nutrition. 2002 Jun;132(6):1129-34. Kumar R, Chhatwal S, Arora S, Sharma S, Singh J, Singh N, Bhandari V, Khurana, A. Antihyperglycemic, antihyperlipidemic, anti-inflammatory and adenosine deaminase—lowering effects of garlic in patients with type 2 diabetes mellitus with obesity. Diabetes, Metabolic Syndrome and Obesity: Targets and Therapy. 2013:(6) 49-56. Ashraf R, Alam Khan R, Ashraf, I. Garlic (allium sativum) supplementation with standard antidiabetic agent provides better diabetic control in type 2 diabetes patients. Pakistan Journal of Pharmaceutical Sciences. 2011 Oct;24(4):565-70. Aa;a,i-Harandi R, Karamali M, Asemi Z. The favorable effects of garlic intake on metabolic profiles, hs-CRP, biomarkers of oxidative stress and pregnancy outcoems in pregnant women at risk for pre-eclampsia: randomized, double-blind, placebo-controlled trial. Journal of Maternal, Fetal and Neonatal Medicine. 2014 Nov 7:1-8. Zeb I, Ahmadi N, Nasir K, Kadakia J, Larijani VN, Flores F, Li D, Budoff MJ. Aged garlic extract and coenzyme Q10 have a favorable effect on inflammatory markers and coronary atherosclerosis progression: a randomized clinical trial. Journal of Cardiovascular Disease Research. 2012 Jul;3(3):185-90. Le Melledo JM, Mahil N, Baker GB. Nitric oxide: A key player in the relation between cardiovascular disease and major depressive disorder. Journal of Psychiatry and Neuroscience. 2004 Nov; 29(6): 414–416. Hatono S, Jimenez A, Wargovich MJ. Chemopreventive effects of S-allylcysteine and its relationship to the detoxification enzyme glutathione S-transferase. Carcinogenesis. 1996 May;17(5):1041-4. Josling P. Preventing the common cold with a garlic supplement: a double-blind, placebo-controlled survey. Advanced Therapy. Jul-Aug;18(4):189-93.